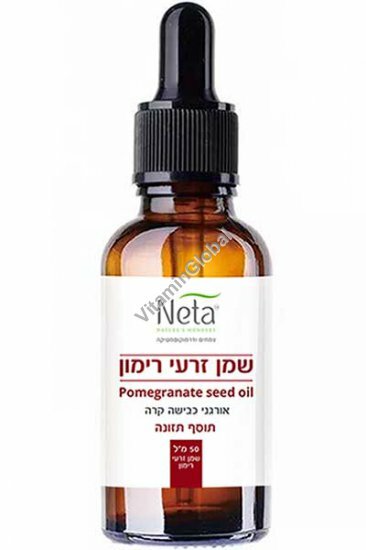 Neta's cold-pressed organic pomegranate seed oil is suitable for both drinking as well as applying to skin. Pomegranate seed oil is high in antioxidants, and thus has anti-aging properties, along with the other health benefits of antioxidants. Perhaps more importantly, pomegranate seed oil contains many fatty acids, of which over 60% is punicic acid (whose name derives from the Latin word for pomegranate: punica). Punicic acid (all called trichosanic acid) belongs to a group of fatty acids called conjugated linolenic acids, or ClnA for short. CLnA is a relatively rare molecule that has the ability to reduce insulin resistance and treat blood sugar imbalance, inhibit inflammation, is active in the prevention and halting of atherosclerosis, prevents estrogen-dependent cancers, improves distribution of body fat, strengthens the immune system, and more. Pomegranate seed oil also seems to prevent and even treat breast cancer. Researchers from the prestigious Technion in Haifa, Israel, discovered that pomegranates can play an important role in treating breast cancer and increasing the safety of hormone replacement therapy. The Technion's study showed that pomegranate seed oil has a mechanism that induces self-destruction (apoptosis) in breast cancer cells without affecting healthy breast cells. As mentioned above, pomegranate seed oil contains fatty acids. These have excellent properties that are beneficial for the skin. Fatty acids increase skin elasticity, strengthen cell membranes, protect against environmental damage, and reduce fine lines and wrinkles, thereby helping to maintain a youthful and fresh appearance. Pomegranate seed oil has a thick, viscous texture, and is rich in active ingredients that strengthen the epidermis, smooth wrinkles, and strengthen and stabilize the skin, while the antioxidants in the oil neutralize skin-damaging free radicals. Pomegranate seed oil treats fatty moles and scars, lightens skin spots, and prevents the development and spread of skin cancer. Ingredients: 100% cold-pressed organic pomegranate seed oil. Taken internally - Take 5 drops in a small glass (50ml) of water. Can also be taken by placing 5 drops directly under the tongue. Take twice a day. Used externally - Rub in 3-4 drops of oil onto each patch of clean, dry skin before bed. Amazing product. It works perfectly with my skin. Packaging was great. Will buy it again. Date Added: 04/06/2019, by Samantha R.